Meathead Movers is here to take care of the heavy lifting for you on your move to Laguna Niguel. Our clean-cut student athlete movers are ready to get you safely settled into your new Laguna Niguel home. Beautiful Laguna Niguel, California, boasts an easy oceanside pace of life and some of South Orange County’s most luxurious properties. The city is comprised of a handful of planned communities that are overseen by neighborhood associations. Meathead Movers has developed a strong reputation for great customer service and integrity over the past 15 years. We are happy to be your Laguna Niguel mover of choice, and are devoted to making your move as pleasant an experience as possible. Residents of Laguna Niguel enjoy proximity to some of Orange County’s best public parks and beaches. The city borders Laguna Beach, Dana Point, Mission Viejo and several other upscale communities. Art galleries and hip cafes are scattered on major boulevards throughout the area. Travelling around the area, is easy because the city is connected by California State Route 73, an offshoot of Interstate 5, and is right next door to the Pacific Coast Highway. Nature lovers can enjoy the variety of outdoors activities offered in the Laguna Niguel area. The Sulphur Creek Reservoir, sometimes referred to as Laguna Niguel Lake, lies within city limits. Aliso and Wood Canyons Regional Park, Crown Valley Park, and Laguna Niguel Regional Park can be easily accessed by major thoroughfares that run through the city. All three parks offer a variety of nature trails well-suited to residents and their pets. 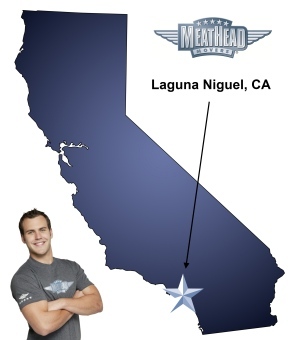 At Meathead, we pride ourselves on being your Laguna Niguel movers. Our unique moving concierge service helps you get settled into your new home by providing referrals to quality service providers in the local area. Our movers are clean-cut student athletes who pride themselves on providing excellent customer service and taking care not to break any of your possessions. Our friendly office staff use a proprietary software program designed to make overseeing and tracking your move easy. We have experience with both local, long-distance, and commercial moves. We also provide reliable packing, storage, on-site relocations, and our distinctive moving concierge service. Unlike many of our competitors, we guarantee that the same moving crew will stay with your possessions throughout the journey. When they aren’t carrying your items, our movers jog. This makes your move go more quickly and helps our student-athletes stay in great shape. Moving to Laguna Niguel is the perfect way to escape the bustling urban space in favor of a more slow-paced, upscale area. We are happy to be your Laguna Niguel movers and to take care of all your moving needs. Call us for a free moving quote today. Moving to Laguna Niguel? Here are some helpful resources. View more Laguna Niguel resources. The guys just weren’t properly trained. They need to pay more attention to detail. I come from a family owned moving furniture business where we moved high end furniture from show rooms in the Bay Area. My father taught me to watch every corner, cover every crevice and whatever you do, don’t ever let something touch the ground. We’d drop things on our toes before we let a mattress or an armoire touch the ground. I get it they’re younger guys which I understand, but I’d just prefer for the price that was charged, that they’d pay closer attention to things. They were awesome guys, good personalities and respectful, but if you want to work for people in Orange County, you’ll have to deliver a better product. I’m not from Orange County either, but people do expect a certain degree of business down here. All in all I’d just ask you to train the guys better, I don’t think it’s necessarily it’s their fault, but they just need to be more aware. Taylor was awesome from the start! He was upbeat and very happy. The team arrived and quickly and thoughtfully moved our things in less than a day! The price was right. Thank you! Was disapppointed that they went over the three hour mark, when I made it clear that I wanted to stay within that time frame and to start with all the bigger items first and whatever was left I would take later if we were cutting it close on time. Also I had moved with this company two years ago from a third floor building and you guys had stayed within the 3 hour time frame with that move, so not sure why this one took so long when I have the same inventory. Angel and his partner were very nice and professional however which is why I’m still rating a 7/10, but disappointed on the time.